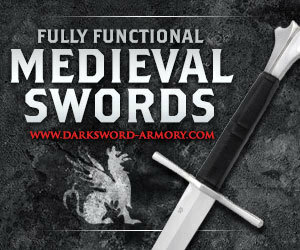 Typical of German swords in use around the 15th century , the DSA Two Handed Gothic Sword is typical of the type of, a large acutely pointed hand and a half sword designed thrusting through maille and the gaps in plate armour, but also capable of inflicting seriously powerful slices and cuts. The first thing that struck me about this particular piece was this German swords distinct fish tail pommel, a common enough feature on swords of this type as seen in Ewart Oakeshotts work, Records of the medieval sword. Extremely thick and weighty, it serves as a great counterbalance to the blade and would make a rather effective weapon in its own right! With extremely crisp lines and an attractive, if not perfect, finish it really does give this sword a unique character of its own. 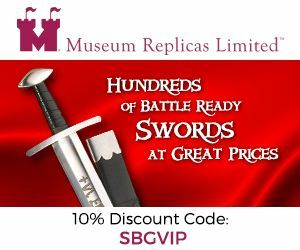 The German swords hilt is wrapped in high quality textured leather with attractive stitching clearly visible on one side. 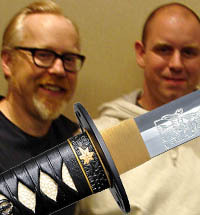 Some people prefer a sword not to show any visible stitching, others love it. Personally like it a lot - it gives it a much more authentic feel. 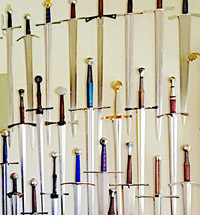 With two risers in the middle, these German swords are best gripped by holding the top leather covered half in your right hand and gripping half of the pommel in your left. Gloves are probably preferable for comforts sake when gripping the pommel in this manner for an extended period, but are not necessary to be able to handle it well. The crossguard itself is very nicely done, a straight octagonal shaped cross beam terminating in slightly flared squared off ends. 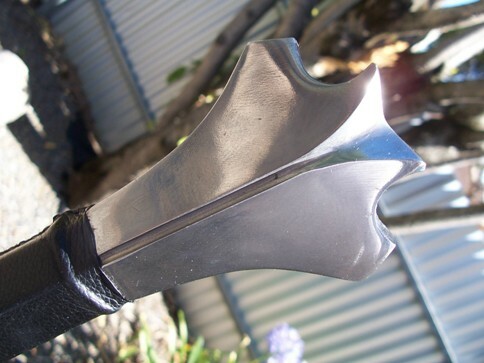 Everything is very nicely and tightly assembled, with the shoulder of the blade closely meeting the hilt allowing no rattling or untoward movement. This is further reinforced by a peened pommel (i.e. 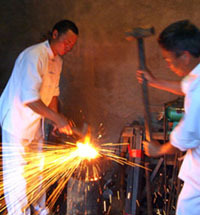 the tang extends through the pommel and is pounded flat to secure it as tightly as possible). The only real criticisms I can level at this sword so far was that the grip seemed to be slightly off center and the polish of the steel fittings was a little rough here and there. Nothing too bad mind you, but noticeable none-the-less. Now as I mentioned before, I was very impressed by the overall appearance and sheer presence of this German swords unsharpened (1.8mm edge) 35" blade. 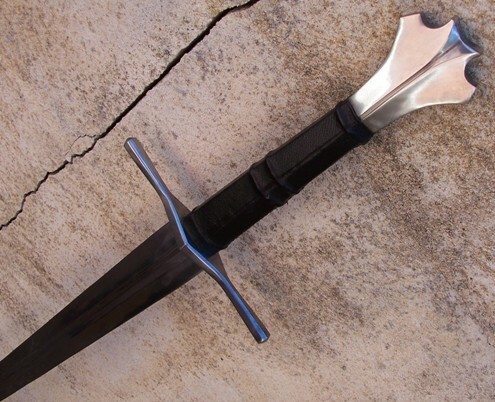 This is a classic Oakshott Type XVIIIa, a solid cut and thrust fighting sword, and you can feel it has both the authority of a very powerful cutter combined with a tip optimised for a deeply penetrative thrust. This is in keeping with the times of its deployment, where on the battlefield most soldiers were fairly lightly armoured with the majority of their protection coming only from a breastplate and helm at best and could be dispatched with a sweeping cut, yet when facing an opponent in plate - it was possible to try and probe through the weak points and split the mail by half-swording (i.e. holding the sword in the middle of the blade with a mailed fist and using it like a spear). A single central fuller runs down two thirds of the length of this German swords blade. 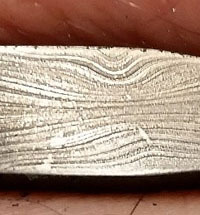 Interestingly, this is where it shows some distal tapering - from a thickness of around 5.4mm at the hilt to 3mm by the time it gets close to the tip. 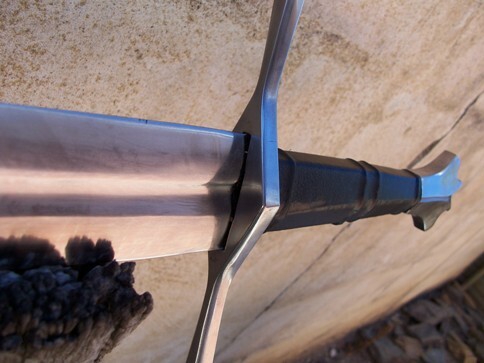 While this is not perfect or ideal, it is quite serviceable and does ensure that the blade is balanced closer to the hilt as it should be. 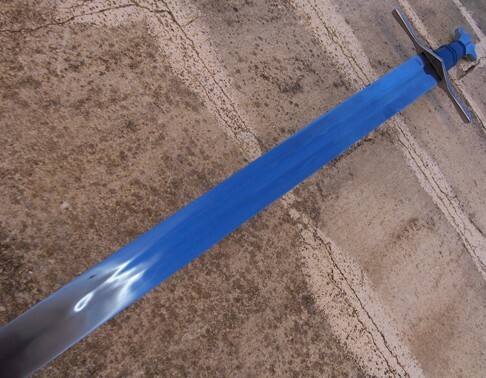 In terms of its tempering, this sword is ideal - with just the right about of flex to be highly resistant to torque, but not at all whippy or flimsy to ensure it can deliver the kind of thrust required to break maille and penetrate as deeply as possible. 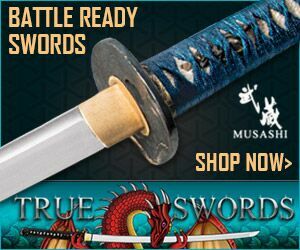 With a total weight of 3lbs 8oz and a point of balance at around 5.5" from the cross guard, this massive looking sword is actually surprisingly easy to wield. 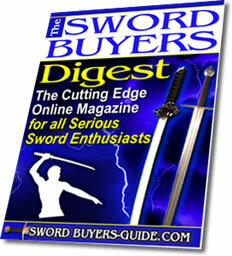 Historically, German swords like this one were never meant to be light weight. And comparing the raw stats to the $1,500 Albion Regent - which is almost the exact same sword in overall appearance and style, on paper at least the differences are minimal (The Regents blade is 2" longer, Point of balance and weight is the same). 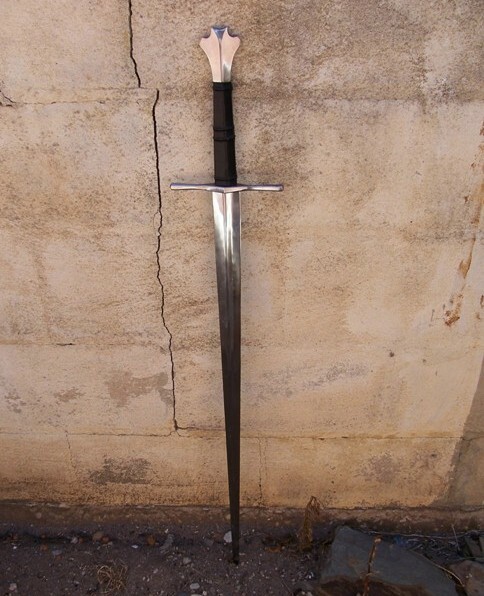 As such, I found this German swords handling to be extremely good - while Darksword has had a reputation for overly heavy swords in the past, this is not one of them..
As you can see, it is far from being the kind of clumsy blade that you might otherwise expect. I kept this sword unsharpened, as I wanted to do some training with it (as you can see from my dry handling video, I NEEDED to do some training) - though I did spend some time banging it against a tree - perhaps my most embarrassing video on youtube as my German swords skills were atrocious (and still are, never quite found the time to do the training as I intended - running SBG keeps me pretty busy). 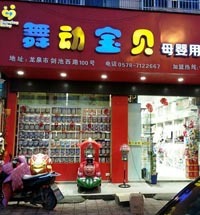 As such, well, I'd rather not highlight that particular video (star wars kid the after years?) 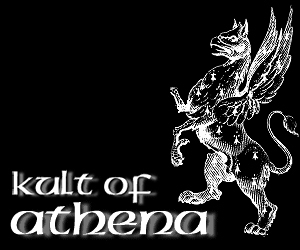 - but thankfully my friend Jason in the USA did some much more impressive independent testing on it..
Jason set up some plate armor and took to it with the Gothic.. And the results, well, they are kind of scary.. The Armor didn't stand a chance..
At various points in the video you can clearly see the sword flexing from the impact and returning to true. This seconded my opinion - that this sword was both quite easy to handle, and extremely (extremely) tough.. 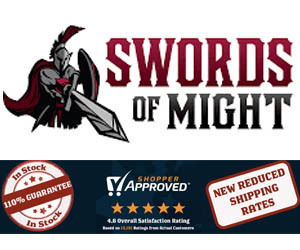 These German swords have it all. They are not bad from the perspective of historically accuracy, with the general design and handling characteristics within acceptable parameters. They are also very attractive to look at - not perfect, but exceptional for a beater..
My only criticism is that I wish that they were available in a pre-sharpened version.